In the News | Historic Jacksonville, Inc.
One of Jacksonville’s first doctors has returned to the public eye after a collection of his books was returned to the shelves of the Beekman Bank at Third and California streets. “I noticed a trend. A lot of them were signed Chas B. Brooks. 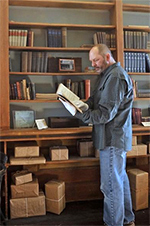 I thought, ‘Who is this?,’ ” said volunteer Gayle Lewis, who was involved in bringing back to the bank 119 volumes that had been in the possession of the Southern Oregon Historical Society. When Historic Jacksonville, Inc. opens the historic Beekman Bank Museum for “Behind the Counter” tours during Jacksonville’s Victorian Christmas celebration over the first three weekends in December, they will also be sharing an early Christmas present with the public. The Southern Oregon Historical Society is returning many of the original books that lined the bank’s shelves, just in time for the holidays. Jacksonville artist Tony Laenen captured the essence of Victorian Christmas with his delightful watercolor depiction of Town Crier and Historian Larry Smith ringing-in holiday cheer. After retiring in 2000 as a Civil Engineer with the US Geological Survey, Tony began painting. Soon after, he and his wife, Carol, moved to Jacksonville in 2014 from the Portland area. He usually works in watercolor and acrylics and is a member of Art Presence where you can view more oh his work during their December art exhibit. In addition, Tony also does woodcarving (1/8-scale carousel horses) and has recently published a book, The Journey. Aired Friday, July 7, 2017 – If you were to make a deposit today at a bank in Jacksonville, Oregon it might be all electronic or using an ATM. But in the late 1800’s things were a little different. We take a trip back in time, to much simpler time, at the Beekman Bank. Here is theDove’s Demi DeSoto to help make your deposit historic. Aired Thursday, May 4, 2017 – Southern Oregon is rich in history. A gold mining town has had many firsts for the west coast. Many descendants there, today remember the stories told for generations. There is a way to go back in time in Jacksonville, Oregon. Aired Friday, August 19th describing etiquette rules and behavior of the Victorian period in Jacksonville. Aired Friday, August 19th 2016 describing Victorian etiquette with a tour of Jacksonville’s historic Beekman House. View video. Nestled away in the Rogue Valley of southern Oregon, the city of Jacksonville may be small. But with its rich history and thriving tourism, it’s anything but ordinary. July, 2016 Step Behind the Counter of the Oldest Bank in the Pacific Northwest! The historic Beekman Bank is again open for business with docents accepting “deposits” to help preserve and share local history. From 11:00am to 4:00pm, Friday through Monday, the public is invited to step behind the counter of the oldest bank in the Pacific Northwest. Read more. According to one tale from Jacksonville’s colorful past, a gambler caught cheating at cards was lynched one night, his body left dangling from a noose on the front porch of the historic John Miller House. Read more. Throughout December, costumed docents share the origins of popular Christmas traditions and Beekman family holiday festivities in the late 1800s. Read more. Aired December 27, 2014, describing the tour of Cornelius Beekman’s historic residence as it was furnished around 1911. Aired December 26, 2014, about the non-profit organization who’s mission is to bring living history to the Jacksonville’s prominent historic buildings. Historic Jacksonville, Inc. will celebrate the Victorian Christmas Boxing Day tradition on Saturday and Sunday, December 27 and 28… Although Queen Victorian did not declare Boxing Day a national holiday until 1871, the tradition of giving money and other gifts to those who were needy and in service positions can be traced to the Middle Ages… Read more. Throughout December, costumed docents share the origins of popular Christmas traditions and Beekman family holiday festivities in the late 1800s. Find the good luck German pickle ornament … Read more. The next time you wait just a little too long for the doctor, consider the fate of our Victorian ancestors. Maybe the waits were shorter, but what was the quality of their care? That question, and others, are answered … Read more. A kitchen sink that is open underneath may seem rustic, but it was a pioneer family’s adaptation to the rapidly changing health and medical priorities of the Victorian era.The sink, open for air circulation to ward off germs, will be just one of the Beekman family artifacts discussed during tours of the family home … Read more. Crazy quilt pillows made by Julia Beekman, a Victorian crazy quilt that once belonged to Ginger Rogers, and the Applegate Trail Quilt will be among the featured items when the Jacksonville Museum Quilters and Historic Jacksonville, Inc. celebrate Jacksonville History Saturday on June 14th at the 1873 Cornelius C. Beekman House.This popular Jacksonville attraction … Read more. JACKSONVILLE – With a light rain falling, a group gathers at the Jacksonville Cemetery. Umbrellas bloom. Willows weep. It’s not a funeral, though, but a hands-on history lesson. The cemetery tours are part of a new event, Jacksonville History Saturdays, held the second Saturday of the month all summer in this Old West town just west of Medford. The hilltop resting spot is … Read more. Visitors will again peer into the vault and safe of Oregon’s second-oldest bank, as a new group revives tours at California Street’s Beekman Bank on second Saturdays from May through September. Historic Jacksonville Inc. will bring back the tours that ended when the Southern Oregon Historical Society left town a half-decade ago. The new organization … Read more. Historic Jacksonville, Inc., a newly formed non-profit, is making plans for educational programs, events, and activities that will breathe more life into Jacksonville’s historic buildings. “Jacksonville’s economy relies on tourism,” points out Tim Balfour, secretary of the new organization and president of the Jacksonville Chamber of Commerce. “People may come here for Britt, for food and wine, or for history, but Jacksonville’s historic buildings are the core … Read more.